The "cases" (literally translated from "caisses" in French) are double-skin drums with cylindrical shell (sound box, frame), generally shallow compared to their diameter, of Turkish origin ("davul" used by Ottoman Janissaries). 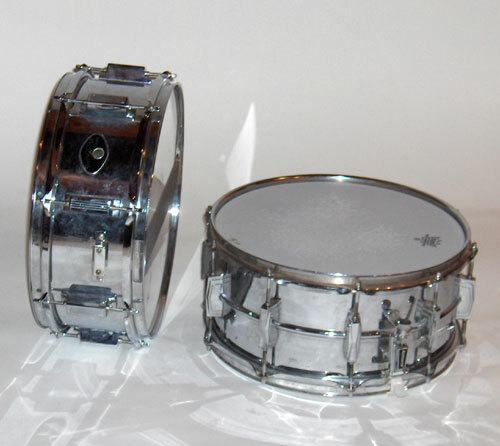 The snare drum ("caisse claire" ("clear case") in French, "caixa" or "caixeta clara" in Portuguese, "caja clara" in Spanish) is small and high pitched (diameter from 10 to 14 ") and bass drum ("grosse caisse" ("big box") in French) is large and low pitched (diameter from 16 to 26" for drumset but orchestral models go up to 40").
. : The snare drum : .
. : The bass drum : . 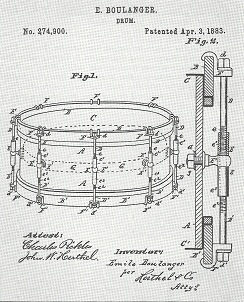 The snare drum, which final shape with double tension is an American invention (patent of Emile Boulanger, 1883 (see photo), with independent tuning of each skin) is normally 14 " wide. This is the standard size, below it is called "piccolo" snare ("small" in Italian, the language of music since the Renaissance and the beginnings of European classical music theory). Its depth varies from 2 to 8 1/2 ". 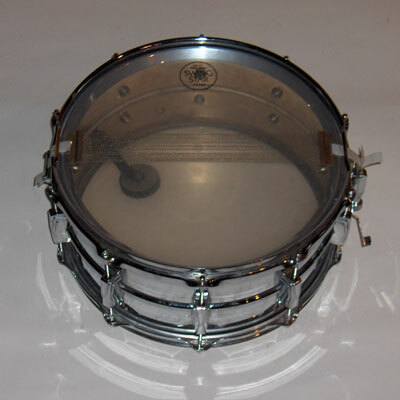 All snare drums are equipped with a snare, and most with strainer to apply or not, and an adjustment screw for pressure against the resonance skin (lever and snare tightener). The snare strands (or wires) are now steel springs (spiral shaped). Some have also an adjustable felt muffler which applies with an outer screw against batter skin from below, inside the shell (see photo: Ludwig Supraphonic LM 402 bottom view). 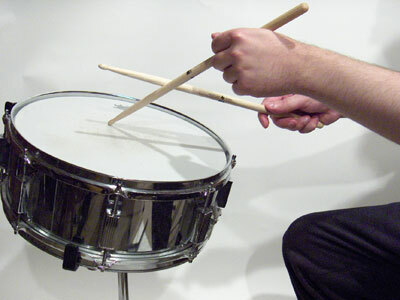 The snare is generally quite strong tightened to dry the sound (to make audible the fast notes of the rolls and facilitate the rebound). It is for this purpose provided from 6 to 12 tension bolts (or rods), depending on the model, per skin (with one lug per tension rod or for two opposite rods (one per skin)). To learn how to tension correctly the drum skins see my lesson: "How to tension your drum skins". The snare drum is the "Queen of the drumset", the instrument the most versatile, expressive and clear (well controlled with brushes, some jazz artists as Max Roach and Andre Ceccarelli , do sometimes solos only with it). It is located in the best place: between the legs of the drummer (do not see anything obscene, it's just the most accessible place of both hands, and this, in a perfectly symmetrical manner, without having to turn the upper body). It can be positioned horizontally or tilted at your convenience (personally I recommend to tilt it only a few centimeters in the axis of symmetry of the body, toward yourself, to allow it to get closer to the height of the toms without blocking the "rim shots." 1: The normal stroke (Tama Swingstar chrome steel snare drum 14" x 5" here) (or hit) is with the round tip ("olive" in French) on the center of the skin. 2: The "cross stick" is a stroke characteristic of jazz and Latin jazz, which consists to hit the snare "rim" (the drum hoop) with the shaft while pressing one end of the same stick against the skin, to make it resonate. 3: The "rim shot" is to hit the rim and the skin simultaneously to dry and amplify the power of the stroke (by a lever effect). Gene Krupa is recognized as the inventor of this technique. 4: Hitting of the rim alone ("rim stroke") looking like the traditional hitting of the Latin timbale shell (Art Blakey and Max Roach used it in the Latin style (salsa, samba, etc .)). 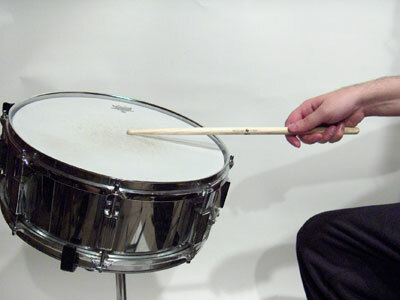 5: The "stick shot" is another special snare stroke: the stroke of the stick shaft against the other stick, with the end of a stick placed on the skin (or "stick on stick"), very used by first jazz drummers. 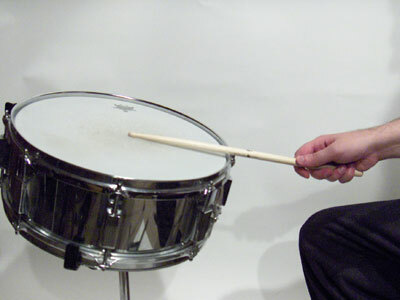 The specific basic technique of the drummer is the "roll" ("long roll" or "double stroke roll" in English, simply "roulement" in French), which consists to let the stick bounce (or rebound) once between each single stroke (alternating right hand, left hand) . This technique is called the "papa-maman" ("daddy-mommy") in French military drumming. But jazzmen and brazilian drummers have developed this concept by varying the number of bounces (from 0 to 3), to acquire a great freedom and independence of hands. 4 – The "single drag tap" ("rigodon" in French): a single stroke roll with a double stroke twice fast and intercalated with symmetry (6 beats): R - LLR - L - RRL - (- = rest). All these techniques have gradually been adapted to the modern drumset with pedals, without rebound, with feet and hands alternating (the most common example: right foot /left hand, holding independent beats with the right hand and left foot or right hand in unison with right foot). Another classic European military technique that is also found in djembe players and using hitting with both hands, is the "flam" ("fla" in French). It consists to give very close two strokes (one with each hand) and isolated. Virtuoso drummers combine and chain with ease, flas, single strokes and double strokes. A technique coming from the first virtuoso modern drummers (Gene Krupa , Buddy Rich ) consists of alternating finger strokes and wrist strokes to perform a kind of one handed roll, and so multiply the speed while staying "clean" and equal in the playing. It also allows giving the impression of playing with 4 arms in addition to the feet, using the ride cymbal or hi-hat with the right hand and snare with the left hand, with superimposed playing (polyrhythmic). Drummers like Dave Weckl or André Ceccarelli are present masters of this technique. Tony Williams also excelled in this exercise. Alternating strokes allows also to put an accent on the second stroke of a double stroke, without tiring. You can also alternate the wrist stroke and arm stroke, technique widely used in "reggae" on the hi-hat. 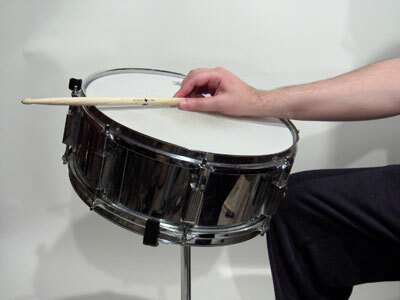 This more traditional military drum technique (described for the first time in writing by the American drummer and educator Sanford Moeller , this is why it is commonly called the "Moeller technique" or "Moeller stroke"), consists of alternating one stroke by the impulse of the rear arm (with elbow joint) and the forearm (with the wrist joint). See a detailed description of these sharp gestural techniques with photos in my lesson "Hits alternating". The brushes are another alternative of playing techniques, using their sweeping against the grain of the skin. They are originally in steel strands, flexible and thin, but can also be with nylon strands, less expressive but softer and stronger. See my lesson about the brushes playing with interactive animated drawings: "The brushes". Some drummers like Max Roach or Jack de Johnette use classical timpani mallets to create different atmospheres and styles of play. Finally, rock drummers often use the simple stroke of the sticks against each other (soft and far from microphones) to beat the first measure and thus give the start and tempo of a song (1, 2, 3 and 4, the 4 beats of a 4/4 measure). 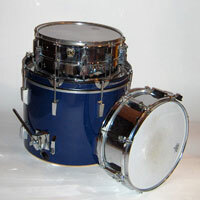 Now see some specific types of composition of the snare, historically. In military drums (drum corps), a section (or group) of snares plays compositions in unison (and therefore pre-written), using all technical refinements (double stroke rolls, different hits, triplets, flams and even juggling and choreography) and in independence with other instrumentalists, but with a strong rhythmic character (the playing is usually quite "flat" in terms of "dynamic" (sound intensity variations) except in the Napoleonic "batteries" (compositions for solo drums) where accents are very present). In jazz, the snare improvises continuously with one hand (the left for right handers) to accompany soloists interactively, while maintaining a repetitive phrase (in two beats) in "independence" with the right hand on a cymbal: the famous "chabada" (or simply "jazz ride pattern"). This technique reminds much the playing technique of Mandingo "dununs" drum played with one hand, the other playing a bell. Instrument of Turkish origin ("Davul", played initially with two sticks, one thick and one thin above, below), the bass drum is traditionally hit with a bat or mallet (thick wand with cylindrical head of wood and surrounded by a thick felt coat) in Europe (on the model of timpani sticks probably from Mongolian origin). Used with hand in the bands, it is actuated by a pedal provided with a spring for lifting (return back of the bat, "beater"), and fixed to an axis of rotation (the wooden shaft has become a steel stem) for drum set ("jazz drums", "modern drums" or "contemporary drums"). The tension of a bass drum skin is generally quite low, to avoid a too brutal bounce and too large vibrations in the foot (which affects the tendons and joints). It also allows to "crush" the beater on the skin easily, when it strikes, which dries even more the sound (personally I prefer, as soon as possible). Rock and fusion drummers often remove the resonance skin of the bass drum to dry the sound and strike harder. You can also muffle the batter (hitting) skin with a blanket or pillow. 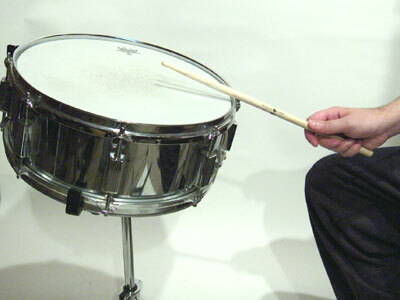 Personally I like the sound resulting from the muffling of the bass drum combined with the removal of the resonance skin (head), because it distinguish better from the bass guitar (same tones) and is close to a tom or snare struck by a stick, which allows to make rolls alternating hands and feet well harmonized and audible (especially with a double pedal). Many current drummers (not only in metal rock style) use a bass drum double pedal or two bass drums (one on each foot) to play classical figures identical to hands, and give an impression of great speed. 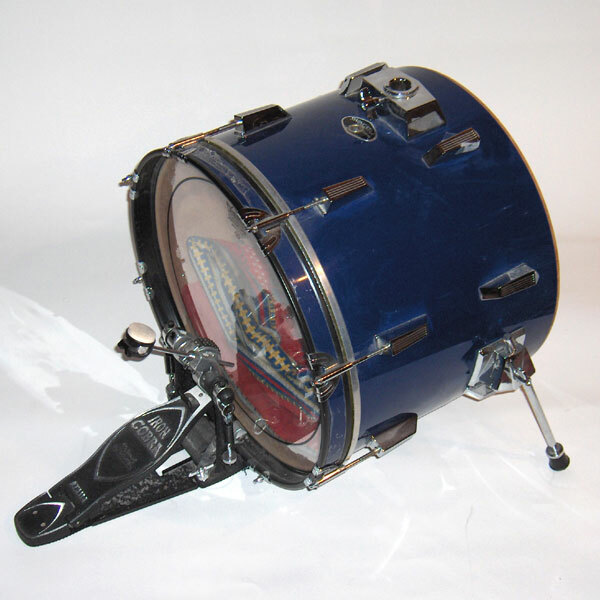 The bass drum (or "kick-drum" for a modern drumset) is usually sold in kit with toms with the same finish but is usually with a thicker shell. It has legs more or less solid and adjustable with rubber end sometimes with steel retractable spurs. I do not recommend the use of spurs, which damage the ground. A good Persian carpet (anti-skid) and a raised position of the bass drum thanks to the legs (so that the pressure of the weight of the bass drum and beater shocks affect only the legs), is generally sufficient to prevent the sliding. We must take care to position its seat on the same mat for body weight prevents movement of the carpet itself (especially if it is painted on the floor). In a room carpeted, the carpet is also useful as protection, as many feet kit often leave marks. The bass drum was originally the instrument which marked the "beat" or "on-beats" (1 and 3 in 4/4) in complementarity of the "off-beats" or the "afterbeats" or "backbeats" of the snare (2 and 4), in marches (Teutonic origin "oom-pah" or "boom-chack"). Pop and rock have kept this basic archaic European composition (probably of Celtic origin), but generally marks only the first beat with the bass drum, while the snare marks all off-beats (more subtle and "in the air" (as we say in France in reference to dance step), which is closer to bebop and African music). In the jazz of the origins and until bebop the kick drum marked each time (which is founded later in "disco" music in 1975 (invented by French drummer Marc Cerrone ) or "techno" or "dance music" of 1990s, but without "swing" purely binary, unlike jazz and close to the Brazilian samba). In the 1940s Louie Bellson (literally "the son of the bell," a prescient name but in fact "Ballasoni" perhaps meaning originally in Italian "beautiful sounds"?) is the first drummer to get the idea and using two bass drums (and playing single stroke rolls with the feet, alternating with of hands on the snare during his solos, technical retaken much later by metal drummers like Mike Portnoy , Mike Terrana , Terry Bozzio , Marco Minnemann , Gene Hoglan , Joey Jordison or Aquiles Priester ). It's perhaps Buddy Rich who initiated in the 1940s, the right hand / left hand / right foot alternating specific to drumset, which will be reused at a huge speed by Elvin Jones , Mitch Mitchell (who says himself that he was inspired by Elvin) and John Bonham in 1960s. Kenny Clarke systematized in the 1950s a free syncopated varied and improvised accompaniment on the bass drum as well as the snare. The first rock drummers have the idea to vary only the bass drum and no more the left hand shortly after (rock drummers were often at that time also jazz drummers). The insertion of "ghosts notes" a few years later, which consists to improvise pianissimo notes on the snare around fortissimo afterbeats, completes to establish the pop or rock style on drumset, and invented by the first drummers of James Brown in the 1960s: John Jab'O Starks, Clyde Stubblefield and Bernard Purdie (which makes it a typical funk style of play and later jazz-funk, purely instrumental with notably Billy Cobham , Jack Dejohnette , Steve Gadd , Dave Weckl and Dennis Chambers ). As for the hands, the technique of "Alternating types of strikes" allows to go faster and accent the second stroke of a double stroke. This is called "heel-toe" playing, which consists of alternating kicks with the heel down, by the muscles of the calf and the top of the thigh, and with the entire leg strokes, heel up (toe tense) by the muscles below the thigh, buttocks and abdominal muscles. 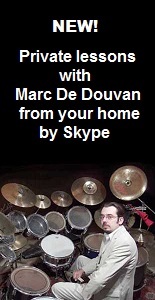 Popularized by John Bonham in 1970, which is also the inventor of the ternary triplet roll with one right hand stroke and two strokes with right foot in continuous flow, this technique shows their greatest masters with the drummers of the 1980s -90, Dave Weckl , Dennis Chambers , Vinnie Colaiuta and Steve Gadd , who push the modern drumset to a level of virtuosity never reached and finally gain respectability to the play of foot and pedals only true specificity of the modern drums compared to other percussion instruments. 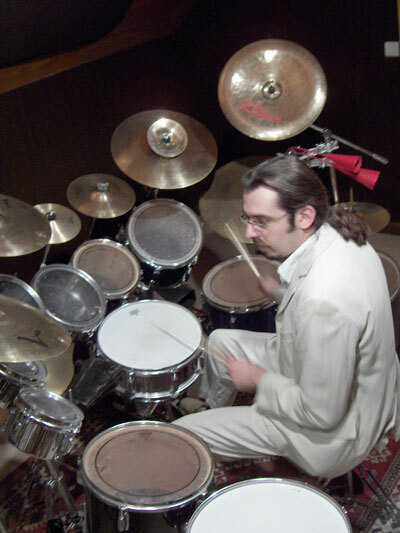 Some contemporary drummers sometimes use a second bass drum with different diameters, to play two different tone with the feet, which can be placed to the right of the bass drum with a double pedal extending to the right of the right foot ( Dave Weckl , Terry Bozzio , Jack de Johnette ). Other uses vertically suspended tambourine with a bass drum pedal, to the left of hi-hat to play a very high pitched drum with one foot (Terry Bozzio , Marco Minnemann ).